INDIA FOR AFRICA OR AFRICA FOR INDIA? The India-Africa relationship has a long and distinguished history and it goes back to hundreds of years, to the days of struggle against colonialism, poverty and illiteracy. The two nations have had long established trade relations, starting from the days when Indian traders made their way to the east coast of Africa in search of elephant tusks, gold and gemstones. Similarity in terms of rich natural resources, demography and a large domestic market showed them the way towards building partnerships. Factors such as similar socio-economic conditions in many of the African nations and India, no conflict of interest and sense of solidarity with the African nations contribute to the shared belief of the two nations to find a common solution to the existing problems. The trade relations between the two nations have become more prominent with the growth of the once immigrated Indian diaspora in Africa. And with the passage of time, they have become critical elements in the export of African goods such as cotton, coffee and tea and the import of Indian products such as textiles and pulses. Today the importance of Africa for India is quite evident in itself. India very much requires the support of the African nations, if it wishes to achieve its ambitions of being a global power and nowhere is this importance felt then on the issue of the UN Security Council’s expansion. Recent years have witnessed the African Indian partnership extending beyond trade to different spheres such as technology transfer, knowledge sharing and skill development .Trade growth from a modest level of US$ 24.98 billion in 2006-07 to US$ 53.33 billion in 2010-11 and CAGR (Compounded Annual Growth Rate) of 20.87% proves that the economic relations between these two nations have grown many fold during the last few years. Some of the biggest Indian names likes Bharti Airtel, Tata Kirloskar, Mahindra, Essar Group are among the 250 other Indian companies having investment linkages with Africa. A large number of factors such as trade Geography, composition of trade and investment in specific areas such as agriculture, mining and telecom define India’s Economic profile in Africa. Scarcity of oil reserves has made India heavily dependent on foreign producers such as the Middle East, Saudi Arabia and Israel which form about 70% of the total supplies, and that has proved to be a key driving force for India’s African engagement because of its urge to diversify the portfolio of suppliers by increasing the amount of purchases in major oil-producing African countries. A large number of Indian companies are becoming livelier in oil rich regions of Angola, Egypt and Libya with some of them already possessing oil investments in Mozambique and investment in gas sector in Tanzania and Kenya. In addition to it, Africa’s nuclear energy potential also drives India’s interest, with India exploring Uranium mining opportunities in Nigeria and Namibia. Apart from these factors, for a major jewelry market like India, richness in precious metals and gemstones garners huge interest. (Gems and stones constitute about 7% of India’s total imports). Africa is equipped with resources that are of vital importance to fuel the economic powerhouses of India, China and Brazil and the African Union is now in a position to take advantage of these assets and boost the trade and bilateral exchanges. The Indian government has always been pro-active on the front of moving the partnership forward and the establishment of the India-Africa Forum Summits has certainly been an important step in that regard. Although, India’s trade with Africa has been dwarfed by China, its overall trade in 2013 stood at US $ 70 billion compared to US $ 200 billion for China. But, because of the increasing dependency of Africa on the Chinese, the African leaders have started to look beyond them and India might just prove to be the right option for them and although India is yet to become a major player, under the new government it is likely to challenge the Chinese supremacy across Africa. Africa is poised to become a global manufacturing hub in the coming future, with the working population to reach about 1.1 billion by 2040, according to a report published by McKinsey in 2010 and India’s capital building focused initiatives in Africa recognizes this fact. The Indian tie ups benefit Africa in certain particular ways, such as the engagement with the rising economies that may help African economies to bypass. An important area of interest for Africa in India is the agribusiness, as it would definitely like to address its food security concerns by gaining from India’s range of knowledge in this particular field. At the same time it also knows that the Indian investment in Africa also means a boost of production. For example: the declining Cotton industry in West-Africa saw radical improvement with the launch of a three-year project by the Indian government. The burgeoning ICT sector is another area where Africa looks to benefit from India, as India with its tailor made-technology for SME’s and vast knowledge and experience in the field of education and Information Technology can have a huge impact in the development of skilled human capital in Africa through transfer of knowledge and skills which is more crucial than just providing extended lines of credit. A very good example of that of Uganda, where Indian technology led to nearly threefold electricity being generated; from 300 MW to 1000 MW. India’s ITEC (Indian Technical and Economic Cooperation) framework which focusses on deputation of Indian experts abroad and training is particularly useful for African nations for knowledge transfer through ITC. The online education industry with an expected worth of $1 billion by the end of the decade, is one area of ICT that could of particular benefit to Africa, India is a major player in this field along with the likes of United States. The lack of skilled teachers and rising internet penetration in Africa provides the ideal ground for a large scale growth of online education system. The said industry has already taken off in South Africa with launch of services such as EduNet and the other African nations should take a hint from it to tap into India’s expertise in this field. India is also a major player in pharmaceuticals and healthcare industry and that is another area where Africa can benefit from. The model of development that India has to offer based on the multicultural and democratic setup is perfectly suited for the diverse ethnic, religious and tribal divisions of Africa. Moreover, the growing demand for commodities in India and China has somewhat helped in the redirecting the African exports toward the Asian market and away from the OECD (Organisation for Economic Co-operation and Development) nations. India has looked to position itself to exploit Africa’s niche areas while avoiding direct competition with the Chinese and has been a major collaborator in African development both from outside and within the continent. The recent developments in terms of expanding business relations and investments ensures that the partnership has moved beyond a verbal repetition of the South-South cause. The Indian investment in Africa is by and large different from that coming from other areas of the globe, which tend to drive out local competition whereas the Indian firms operating in Africa promote the local integration of their workers and tend to engage in sales to local African units. For sure, India needs to gather resources for its growing middle class and strengthen its diplomatic ties in the global South but the investors are also nurturing another vital asset i.e. the human capital, and it can be rightfully said that the Indian- African partnership is all about person to person growth on both sides of the Indian Ocean. To conclude, India’s relationship with Africa and vice-versa, has its own opportunities and reservations, but with unique benefits and drawbacks for each of them. Therefore. It becomes imperative that the economic ties between the two nations is approached on terms that recognize this uniqueness. 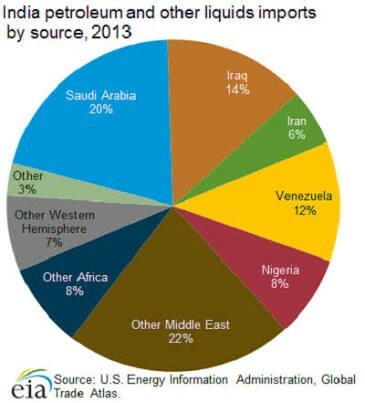 Source (pie chart): U.S. Energy Information Administration, Global Trade Atlas.